It has been a few weeks since my Georgia Bulldogs lost the national championship game in overtime. It was a devastating end to a great season, one I had not experienced since I was a junior at the University of Georgia in 1980. In 1980, it was a big deal to pack the Redcoat Marching Band into seven busses and travel to New Orleans for the sUGAr Bowl. We thought it was great to spend New Year’s Eve on Bourbon Street and then play in the Superdome, what we called the World’s Largest Mushroom. I can only imagine what the current Redcoats felt like when they climbed aboard a chartered 757 out of Atlanta to fly cross-country to attend the Rose Bowl. In 1980 there were 300 total members including auxiliaries and support staff. Today, there are almost 300 musicians in the band. The last bowl game I went to as a member of the Redcoat Marching Band was the January 1, 1983 sUGAr Bowl where we lost to Penn State. I was not happy then but time moves on. Now that we are 35 years later, age has caught up with me and my distance from Athens means I watch the games from the comfort of my living room. The last game I attended was Homecoming in 2012. I have to try to get down there for Homecoming this year! But that Rose Bowl game was something else. No matter who I talk with about the game, it was the most exciting game they have seen, especially for a Rose Bowl. It was the first time a Rose Bowl went to overtime. Needless to say, I was happy with the outcome! Previously, I mentioned I was interested in obtaining a copy of the coin used in the coin toss. In the video, it appeared to be silver in a plastic capsule with the school logos on either side. When I received an answer from someone associated with the Rose Bowl committee, I was told that it was indeed a silver coin, specially struck for the game. Only a limited number are struck and given to VIPs. 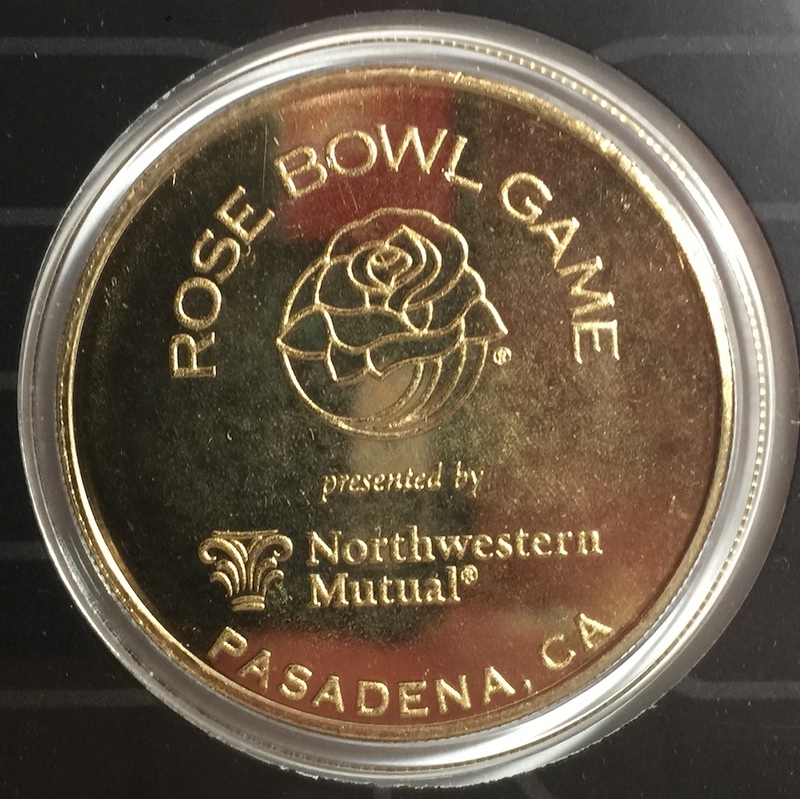 The game-used coin is saved as part of a Rose Bowl museum. There are no extras struck and none are for sale. I decided to find an alternative. 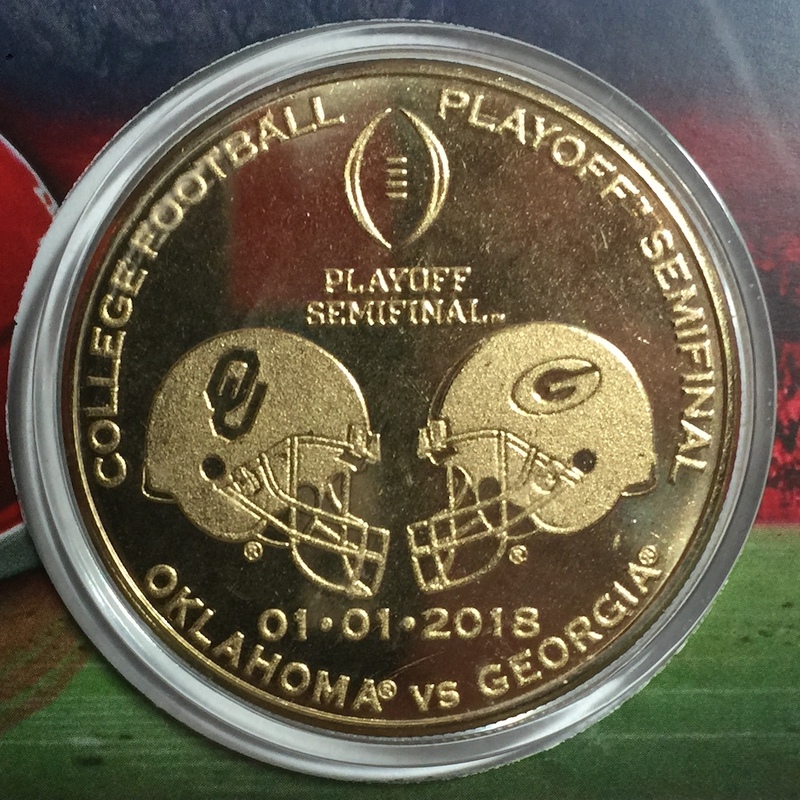 The Highland Mint, in cooperation with the College Football Playoff, struck souvenir medals for each of the games. Medals were struck in brass and placed in a plastic holder with the matchup. They also offer a silver-plated brass medal in a capsule and a velvet-covered case. A medal in a case is pedestrian. It can be mistaken for just about any collectible, even those from the U.S. Mint. I would rather have the commemorative plastic holder with the information about the game. It makes more of a statement and can be displayed on my desk. As I work to open my new business, I am planning on having this medal in my new office. It will remind everyone that if there is an early kickoff next fall, we will close on-time at noon so that I can rush home to my television and watch the game. Hopefully next year I will buy one that says National Champions! HOW  BOUT  THEM  DAWGS!